Every August 26th, gender equality supporters gather in the United States and other parts of the globe to celebrate Women’s Equality Day. If you have a taste for Bitcoin casino games and likewise celebrate the passing of the 19th Amendment, Fortune Jack will add another reason to rejoice this August 26th with a unique Women’s Equality Day bonus. And if you’re not marking the occasion, you can instead go to Bitcasino to sign up for a prize in its latest NetEnt competition. One of a few casinos that fight for causes they believe in, Fortune Jack Casino frequently tries to give support to global and local communities. This year, the casino is running a new special promotion that’s open for any registered punter who wants to mark Women’s Equality Day. The promotion will run until August 27th on Monday, or one day after the special date. Up for claiming this time is a 100% match deposit bonus with a max value of 500 mBTC. To be eligible for the offer, you have to deposit a minimum of 0.002 BTC or any altcoin equivalent no later than 7 days after activating the bonus. This special offer will be valid for 10 days after activation and it also comes with a package of 50 free spins that can be used on Fortune Jack’s slot games. The 50 free spins are given 25 a day for 2 days. To receive the free spins, you will need to wager your deposit amount a total of 1x at the casino. 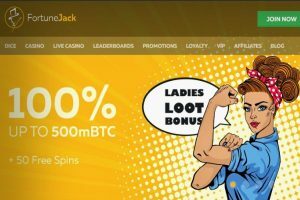 To learn more about other terms and conditions of this offer, just go to Fortune Jack Casino and find the special bonus at the “Promotions” page. Players 11-610 – 25 free spins with a worth of μɃ 154. To enter the prize draw, you just need to play one of the four selected games: Jungle Spirit: Call of the Wild™, Butterfly Staxx™, Asgardian Stones™, and Elements: the Awakening™. For each €50 in BTC equivalent you spend on these slots, the casino will give you one ticket for the prize draw. You can get up to 50 tickets per day to climb far up the leaderboard. The competition will last until August 30th, after which the casino will announce the winners and contact them. If you want to get yourself a ticket, you can head over to Bitcasino and start playing!